Royal Moose Lodge is the latest of our distinctive vacation homes in Branson. This lodge has seven master suites, each with a luxurious king bed, own TV, and own bathroom. Six bedrooms have their own whirlpool tub and shower. The seventh has a shower. Royal Moose Lodge sleeps up to 24 guests (max) with a large dining area and family room with pool table, air hockey, and Foosball. There are two back decks to relax on. Located less than a mile from Silver Dollar City and two miles from Indian Point Marina for fun on the lake, Royal Moose Lodge is the perfect location for your family reunion or church group. About 50 yards up the hill is the nice outdoor community swimming pool with two water slides, kiddie pool, and hot tub. The common area has a basketball goal, horseshoes, playground, shuffle board, and fire ring. In addition, off site amenities (less than 15 minutes away) are available that include indoor swimming and hot tub year round. The main level is wheelchair friendly and has towering cathedral ceilings with an open floor plan of the great room with stone fireplace and TV, and fully equipped kitchen with two refrigerators for your large group and a convenient island. The area by the kitchen is open to a large 12 X18 dining room. Step out onto the upper back deck which is open with Amish hewn log railing. There you will find more dining and a gas grill for barbecuing. There are two master suites on the main level, each with their own king bed, TV, and soothing whirlpool tub. There is a pull-out sofa in the great room. 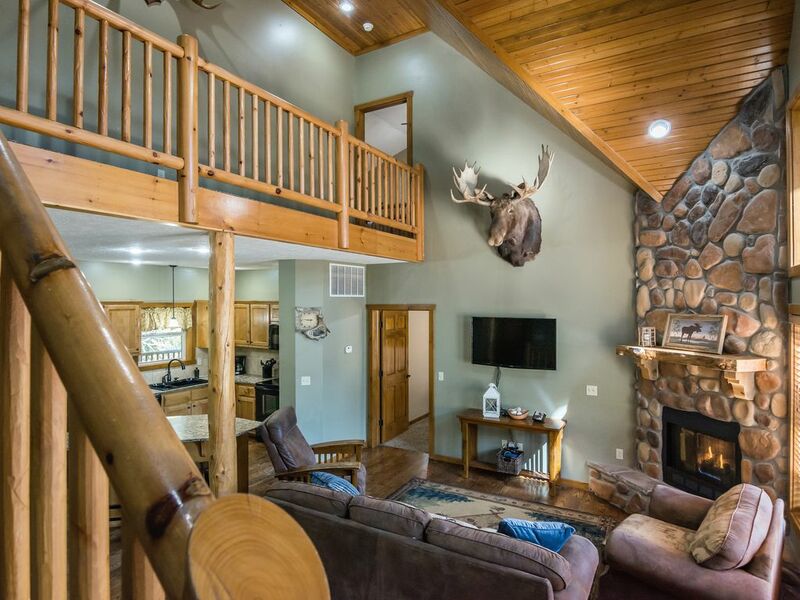 Climb the stairway with log railing to the upper level where you'll find two more larger master suites, each with a king size log bed and a full size pull-out sofa so kids can sleep in the same room as parents if they'd like. These rooms each sleep four and have their own TV. Head down to the lower level where there are three more master suites, two of which have a whirlpool tub, the third a shower. The family room has a tournament pool table, air hockey, and foosball table. There are two pull-out sofa sleepers with 7 inch mattresses and another stone fireplace with a big screen TV. Step out onto the second back deck which is screened in. The ceiling fans keep you cool while the screen keeps out the bugs as you relax and listen to the sounds of nature. Royal Moose Lodge has more distinctive features and high end quality furnishings. Come spend Christmas in Branson and stay with us. Makes a great family Christmas present that creates memories for years to come. Open for three night stay arriving Dec. 23. Although our Homeaway/VRBO listing states no refund for cancellations, we do have a cancellation policy in which refunds are given. Cancellations made for reservations during the peak season, mid-May through mid-August, are given a full refund, minus a $250 booking fee, if cancelled more than 120 days prior to scheduled arrival. Inside of 120 days of arrival, there is no refund. For all other times of the years, cancellations made more than 60 days prior to scheduled arrival receive a full refund, minus the $250 booking fee. Inside of 60 days of arrival, no refund. We highly recommend guests purchase traveler insurance. Perfectly located close to many shows, shopping, Ozark attractions, and Table Rock Lake, Royal Moose Lodge, with it's charm and amenities, is ideal for your family or group's next visit to Branson. Community common area that has outdoor swimming pool with two water slides, hot tub, kiddie pool, and playground. Indoor swimming pool available at an off-site resort about 12 minute drive away. There is seating for 16 at the long table, seating for eight on the upper back deck, and seating at pub tables on the main level and at the kitchen counter. Game room has pool table, air hockey, and fooseball table. There are no steps into the home or on the main level. We have had wheelchair guests stay here, but it is not ADA code. Swimming pool has two water slides and also a kiddie pool. There is handi-cap entry. Indoor swimming is available at an off-site resort about 12 minutes away. This is a wonderful place for a group gathering. We have utilized this house the past few years for a Christian Women's Conference that is held in Branson. We love that every master suite has it's own bathroom and there is plenty of room for us. Wonderful home where memories are made! We truly loved our time at Royal Moose! Four families with a total of 10 kids is usually tricky, but we all had our own bedroom and bath and there was room for the kids to play! Two things to improve on - the listing makes it seem as if there’s is an indoor pool on-site. Eight adults read it thinking that. Only the outdoor pool is on-site. We also had a wasp issue in one of the basement rooms. The owner sent someone out to spray the day I called but wasps still came into the room (15 total). Hopefully this will be fixed ASAP before it starts to really get warm. Other than that, we would definitely come back to stay! Great location and views. Glad you made some wonderful memories at Royal Moose Lodge. The listing clearly says the indoor pool is at an off-site resort about 15 minutes away. Not only in the description, but also in the picture. We addressed the wasp situation the same day and you were told that you may see a few yet, but they would be trying to escape as they were dying. There were no wasps when housekeeping checked cleaning your stay, and the guest following you have seen no wasps, so it was taken care of. We had a group of 7 couples from all over the country meet here for the weekend and the house was perfect. Rooms were great, perfect size for our group. Accommodations were amazing couldn’t have asked for a better cabin! We had 4 families at the cabin for a weekend. We were very pleased with the cabin. The kitchen is stocked for every need, there is plenty of entertainment, and we appreciated the extra blankets and portable heaters that were available. We are planning on coming back next year! Awesome tplace for big family time! Silver Dollar City Amusement Park - This has been one of our favorite places to go in Branson for years. June and I went here on our honeymoon in 1979. It was here on one of our family vacations in the early 90's that June and I started dreaming of having a place where folks with families or groups could all stay together in one place without having to get multiple hotel rooms. We still enjoy the 1800's park theme and all the shows. Be sure to go on the train ride. Kids love the various rides. I told my children that when I was a kid in the 60's, there was a ride here that was pulled by mules. They didn't believe me until I was able to show them a picture. Table Rock Lake - we love to get out on the lake in a boat. The grandchildren love to get pulled behind on the tube. Sight and Sound Theater - This theater has what we feel are the best shows in Branson. 100+ live shows - So many good shows from Dixie Stampede, SIX, Pierce Arrow, Kirby the magician, and on and on. White Water water park - lots of water slides, lazy river, wave pool, kiddie area. It's an all day affair. Every year now, we have to take the grand kids to do the go-carts and laser tag on the strip, which is less than 10 minutes away. 5 night minimum for 4th of July, Thanksgiving, Christmas week. Other holidays have $50 per night additional and include New Year's, President's Day weekend, Memorial weekend, Labor Day weekend, all three night minimums. Holiday rate applies to every night of a stay in which a holiday is involved. Arrival dates and/or minimum night stays may vary according to dates already booked.